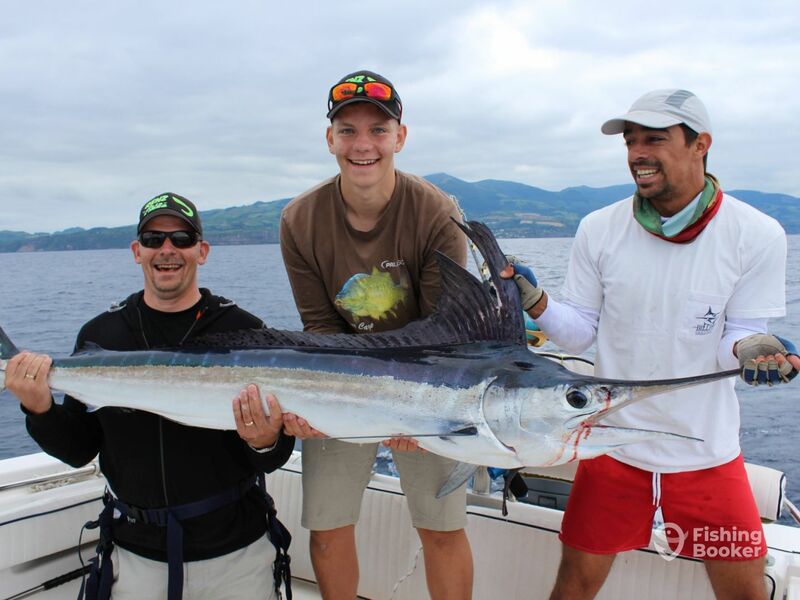 Spend an awesome day out on the water with Azores Sport Fishing, targeting big game or staying closer to the shore. Whatever your experience level, there is a trip to suit you. The day will be spent with Sérgio and Paulo, 2 natives who have been fishing for decades. Sérgio is a knowledgeable skipper and Paulo an experienced first mate. They both know the best banks and spots to take you to have the most productive day. 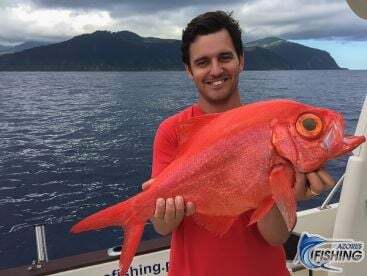 The Azores islands are a hotspot for fishing due to the location of the islands in the middle of the Atlantic ocean, the Gulf Stream and submerged banks. 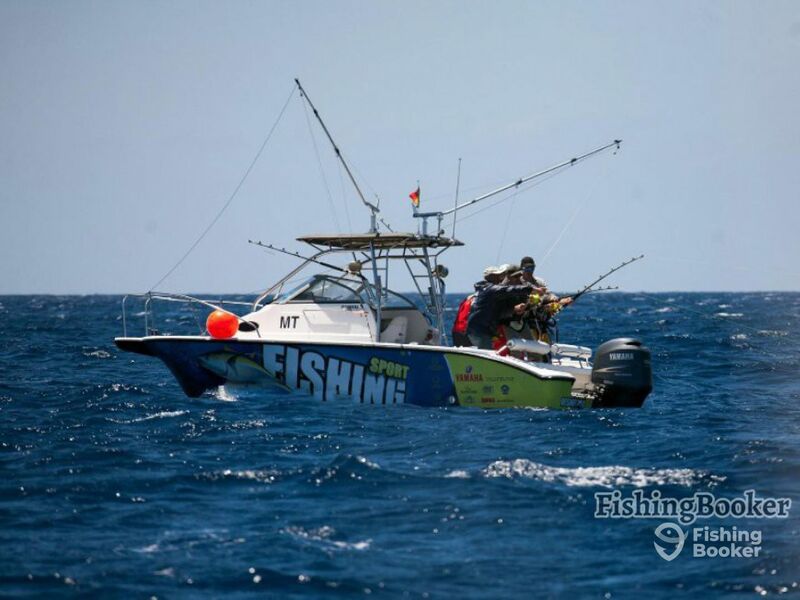 Hop on board their 23’ Yamaha boat, that has a 150 HP engine to help you get to the fish fast. 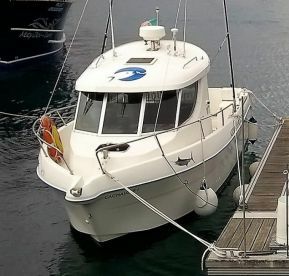 This vessel also has top navigational equipment, including Garmin fishfinder, helping you to keep on top of the fish all day long. Species that you’ll be able to target on the offshore trips include migrating Blue and White Marlin, Albacore Tuna, Bigeye Tuna, Bluefin Tuna, and Mahi Mahi. The coastal trip will see you using more varied techniques to catch the fish. 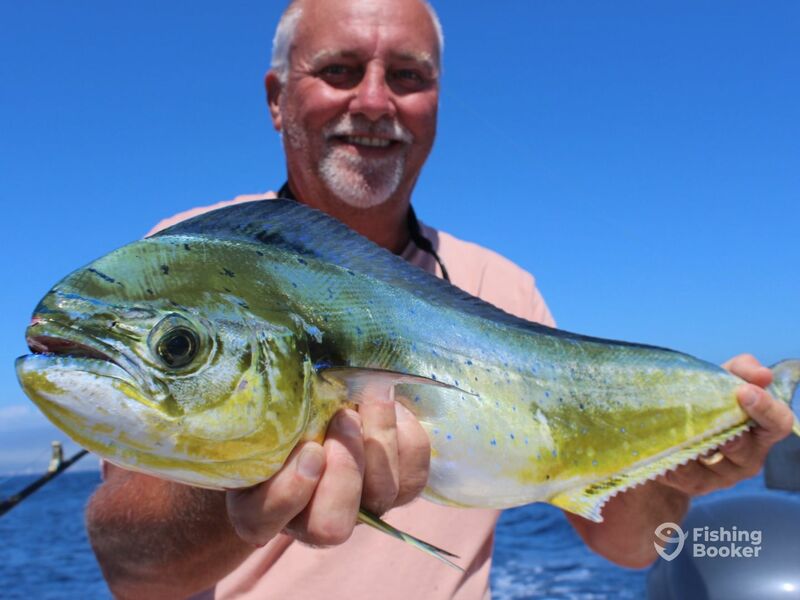 You’ll be trolling or jigging for Barracuda and Bluefish, as well as jigging for Amberjack and Seabream, or even bottom fishing for Snapper and Grouper. The best time to go big game fishing is from spring through to fall. The action slows down during the winter, but the crew are happy to head out if you want a trip during this time, but the bite will be much less than compared the summer. Drinks are provided on all trips, and on the full day trips, a light lunch is also supplied. All of the rods and reels you’ll use are included in the price. You just need to bring along plenty of sunscreen and enthusiasm. There’s no better time to book. 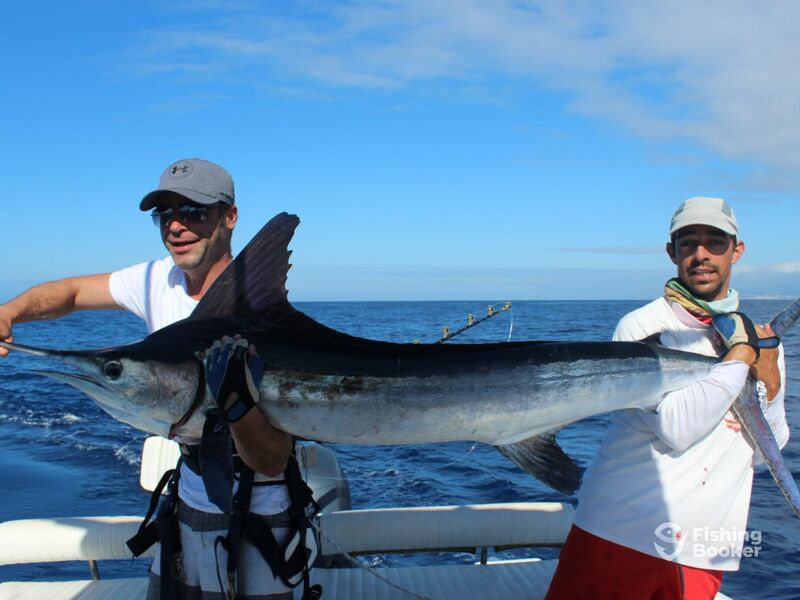 Come have an unforgettable adventure with Azores Sport Fishing today! If you want to fish big game, this 8-hour trip is the best choice to go for. 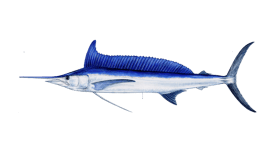 You'll have time to get to the fishery, target Blue and White Marlin, Bigeye and Bluefin Tuna, Wahoo, and Mahi Mahi. For this trip, a light lunch is included, as well as all fishing equipment. The waters within sight of Azores have a lot to offer, and Seazores will help you get the most out of them. Whether you choose to troll nearshore, bottom fish, or enjoy high speed jigging (or even go for a combination of the three) you will have a high chance of catching fish. 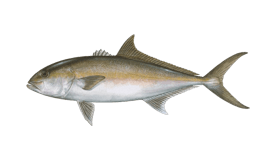 These include Bluefish, Barracuda, Amberjack, Snapper, Grouper, and many more. All fishing equipment will be provided. 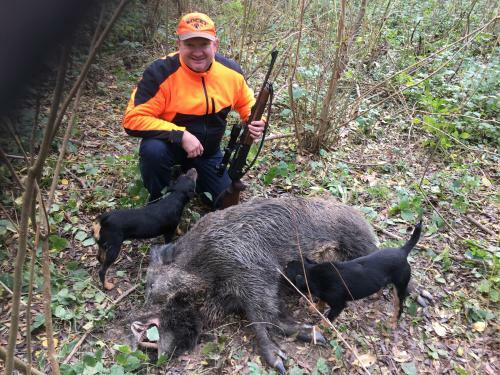 This trip is great to introduce you to big game fishing, but for the full experience, the full day trip is advised. This trip is best from spring through to fall. Expect to see White and Blue Marlin, Bluefin and Bigeye Tuna, Wahoo, and Mahi Mahi. All of the necessary fishing equipment will be provided. Fishing for big game species such as Blue and White Marlin, Bigeye and Bluefin Tuna, Wahoo, and Mahi Mahi. 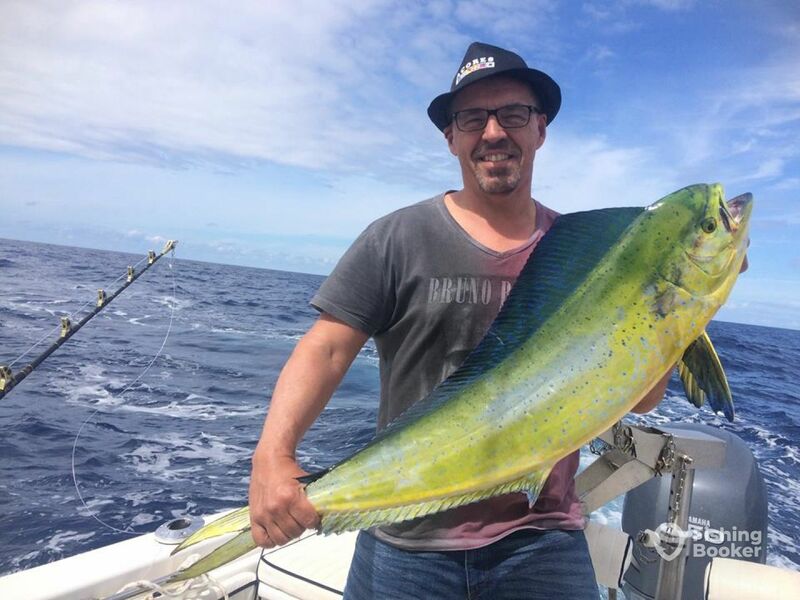 This trip will give you an introduction to big game fishing but to get the full experience it is advised to try a full day trip. These trip are not advised during the winter. All of the rods and reels are provided. There are many options on this trip. 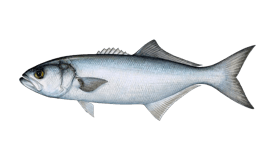 You can troll for Barracuda and Bluefish, go jigging for these plus Amberjack and Seabream, or bottom fish for Snapper and Grouper. All rods and reels are provided. 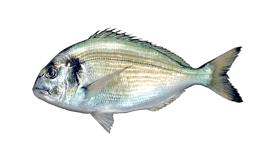 Depending on the conditions and your preferences, you may be trolling for Barracuda and Bluefish, jigging for both of these as well as Amberjack and Seabream, or bottom fishing for Snapper and Grouper. All this will be close to the shore. All of the fishing equipment will be provided. Yamaha (Saltwater fishing) построена в 2012. Мотор – 150HP Yamaha мотор, максимальная крейсерная скорость – 30 узлов. Seazores is a small company owned by two partners who are natives from São Miguel island and are huge lovers of nature. They see their clients as more than guests, but more like friends. They will do their utmost to give you a great day in fantastic companionship. 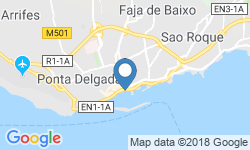 Seazores provide trips targeting Marlin, Tuna, and Mahi Mahi, as well as Wahoo, Amberjack, and Bluefish when coastal fishing. Seazores are licensed by the Azores government authorities for tourism, members of AREA.T (Association Of Touristic Animation Companies Of The Azores), Partner of Parque Ambiental dos Açores (environmental park of The Azores) and Terras do Priôlo (Azorean Bullfinch Land). We had unforgettable experience with this full day trip. Sérgio and Natasha are not only very good fishermen, but they are excellent hosts. They are very kind and friendly people. We had excellent fishing and all day fun with them. We enjoyed not only the fishing trip and the catch of the fish, but their company too. We learned a lot not only about the local fishing, but also about the culture and the history of the island. We highly recommend them for the good fishing and for creating a very memorable experience too. Definitely we will come again and have fishing with them, but also a trip and sightseeing of the island. Great couple running the boat, Natasha was a great skipper. The crew worked hard to put us on the fish and we caught Barracuda and Bonita. We would highly recommend this company. 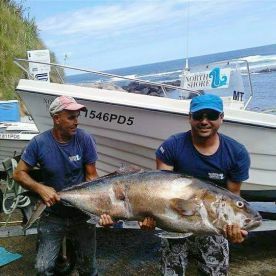 We had two fishing trips with Seazores, one day big game and one day coastal trawling and bottom fishing, Captain Sergio and assistant Juan provided excellent support during these days and stood open for our suggestions on alternative locations/activities. The first day on big game unfortunately provided no strikes, the second day a few nice barracuda’s were caught whilst trawling and speedjigging, furthermore a 13 kg amberjack provided a good fight and nice meal. 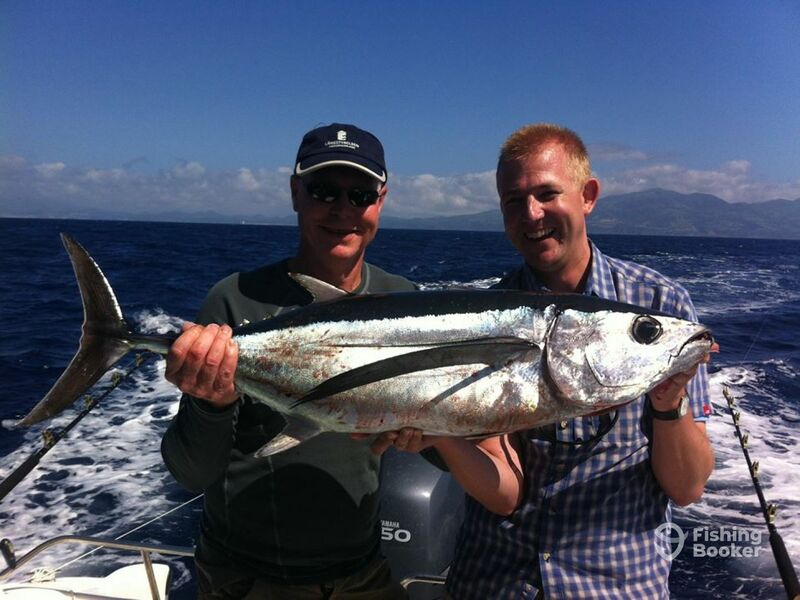 We had an excellent two days fishing and highly recommend Seazores. Adrie & Ernest from Holland. It was a picture perfect afternoon on the water with warm temperatures, light winds and zero swell… not the best conditions for fishing but Sergio and Nuno still put us on to plenty of fish. We spent a lot of time bottom fishing various marks for a variety of Bream, Comber and one nice Grouper. On our way back we set out some lines for some trolling; we had one hit but missed the hookup. Sergio has a fine boat and excellent equipment; we were easily able to spot fish in the depths of 30 to 80m on his sounder as we fished. Sergio and Nuno were fantastic company and kept us happy and refreshed throughout the entire afternoon. 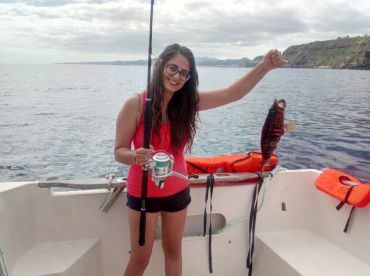 I’d definitely recommend Seazores to anyone interested in charter fishing in the Azores.